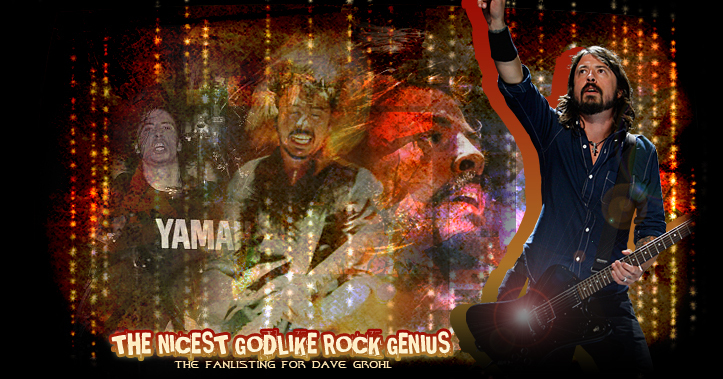 You've just reached "THE NICEST GOLDLIKE ROCK GENIUS", the TFL-APPROVED fanlisting for DAVE GROHL, one of the living most talented rock musicians and leader of THE FOO FIGHTERS! This fanlisting has been adopted to me in December 2011 by Georgina ♥ to whom I'll be forever grateful for granting me such a huge wishlister. Dave is one of my favourite musicians ever, and being able to run his fanlisting is an honour for me. The title could seem a little pretentious but, even if I don't like to use definitions for people, I've decided to merge a couple of "titles" which Dave deserved: the one of being know as the "nicest guy in rock" and the one of "Godlike Genius" he earned at the 2011 NME Shockwave Awards! Dave Grohl is the owner of the rights on his person and his music, and this site in not recognized by him or his staff in any way or mean. This is only a fansite and the webmistress doesn't intend to violate those rights. Layout and contents are (c)Akira K.S. Do not reproduce without permission. Images found through Google Image search. Textures by: Princess of Shadows and Angelwings. Online since: December 19th, 2011.